Transnordic Hydraulic Valves part of the Hydraquip Group have a long established history in the design, manufacture and supply of waste management control valves and accessories. Manufacturing hydraulic control valves for a number of applications including skip trucks, hook loaders, refuse trucks and ejector trailers. Working closely with customers, Transnordic Hydraulic Valves Division have the in house capabilities to design custom made valves to a customer’s specification. The engineering team will offer enhancements to a design to maximise a valve’s performance. Operational requirements and working procedures are discussed in detail to establish a full understanding of the system operations to ensure all proposals are suitable and result in an immediate and long term improvement. The PD80 high performance, heavy duty multi sectional valve designed and developed by the engineering team at Transnordic offers a simple operation with options of 1 to 10 sections for open and closed centre hydraulic systems. 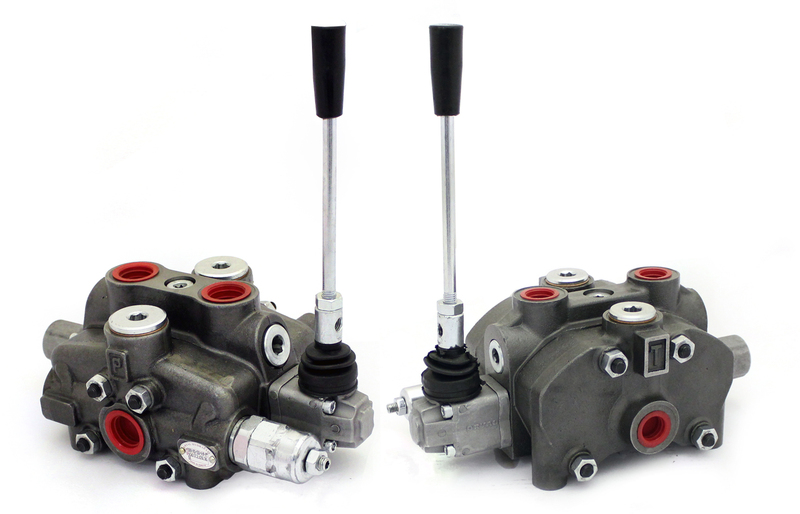 The PD80 hydraulic control valve with a pneumatic control option is close coupled to the main control hold to run the lever providing an air supply to and from the clutch air shift cylinder which is easily mounted to the air operated clutch engaged Power Take Off (PTO) unit of a waste vehicle. In addition to the pneumatic sectional valve, Transnordic Hydraulic Valves offer a choice of manual, hydraulic, and electro-pneumatic spool control kits. These PD80 high performance heavy duty sectional valves for the waste management industry are fitted with a main pressure relief valve and interchangeable spool diameters. With optional extras available including pressure limiting cartridges which can be fitted to individual cylinder control sections, carry over ports available on tandem circuits and accessories including detents, air pilots, EP pilots, relief valves, port relief valves and anti cavitation relief valves. Transnordic Hydraulic Valves’ robust high flow monoblock valves range from 1 to 6 sections, with the option of additional spool functions using a high pressure carry over fitting. This valve is designed for a maximum working pressure of 320 bar with a flow from 40 to 140 l/min, making this high performance valve ideal for hook loaders within the waste management industry and suitable for forklift trucks, lorry mounted cranes, dumpers, excavators and other equipment where precise load control is required. If required, the electro-pneumatic and electro-hydraulic proportional controls can be driven using electronic programmable controller units due to the low wattage demand. The use of these electro-pneumatic controls allow for the interfacing with a customer’s programmable controls.